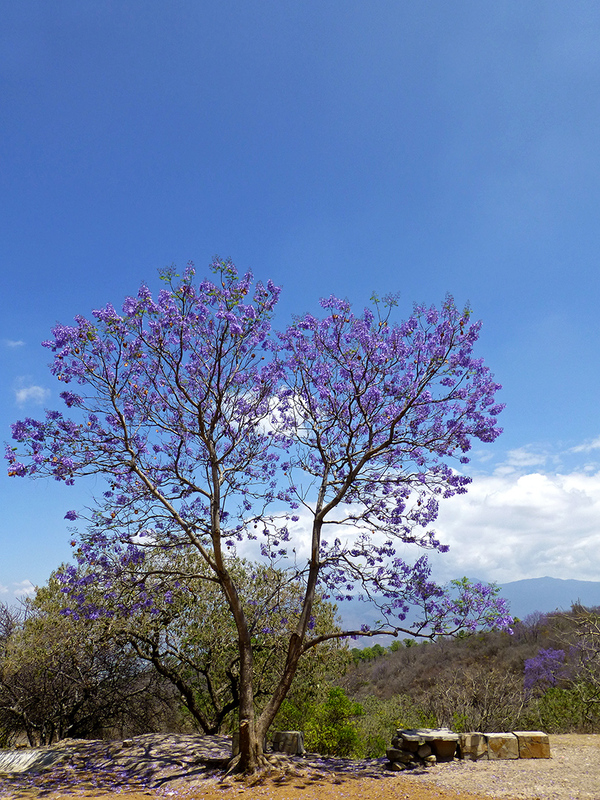 Purple isn’t the only color signaling spring is on the way in Oaxaca. 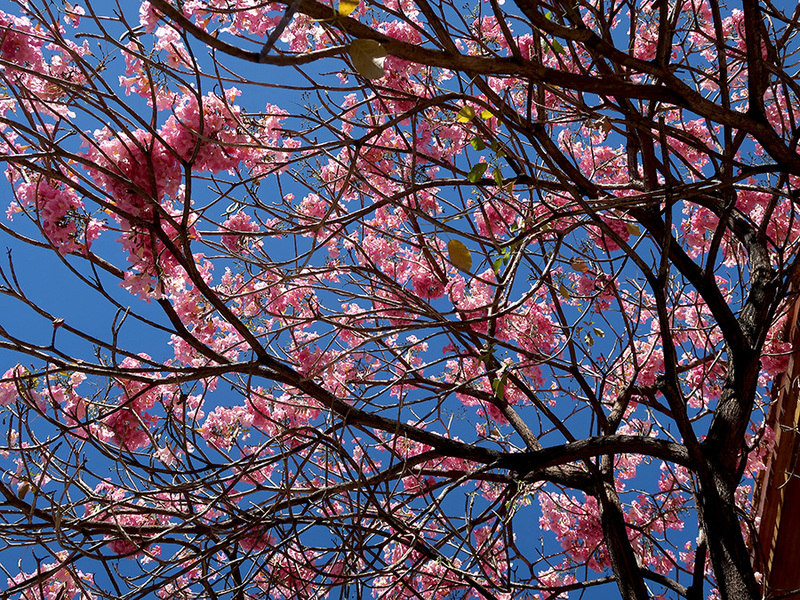 The city is also alive in the pink of Tabebuia rosea blossoms. 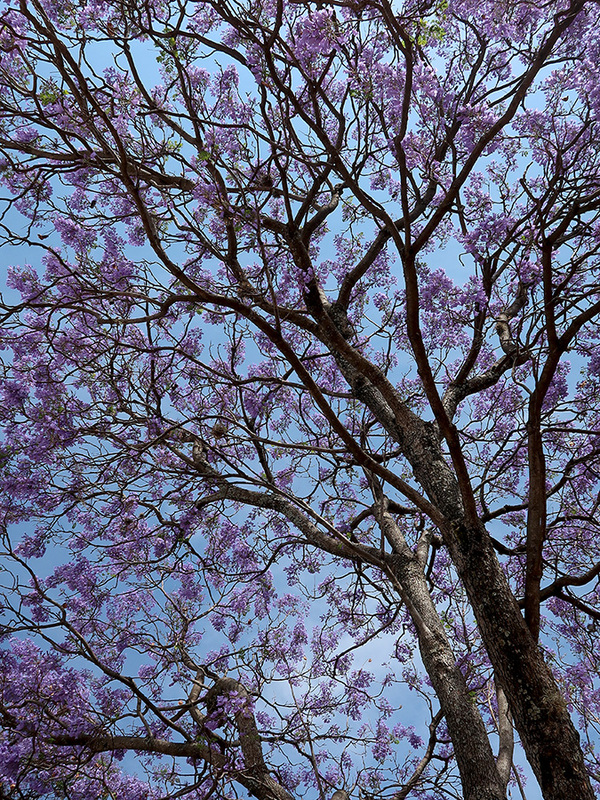 It’s Tabebuia rosea and jacaranda time. 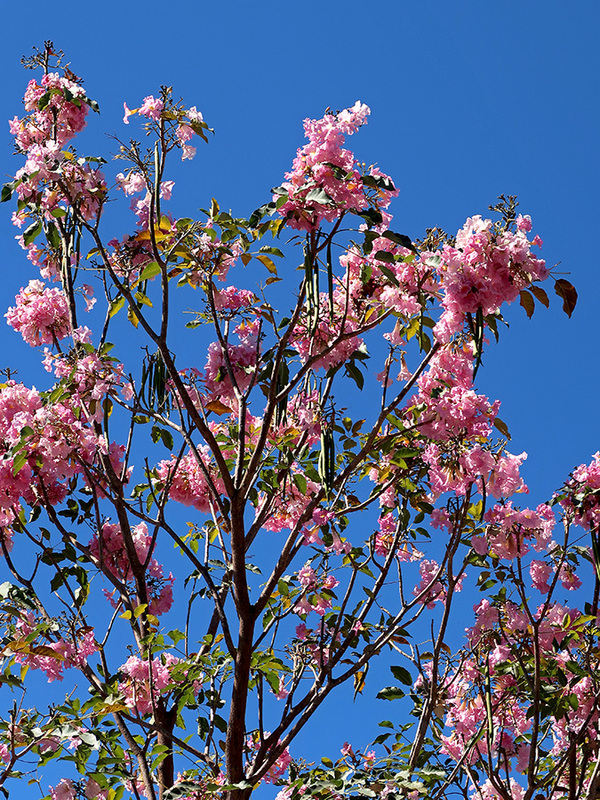 a not-so-subtle sign that spring is on its way. 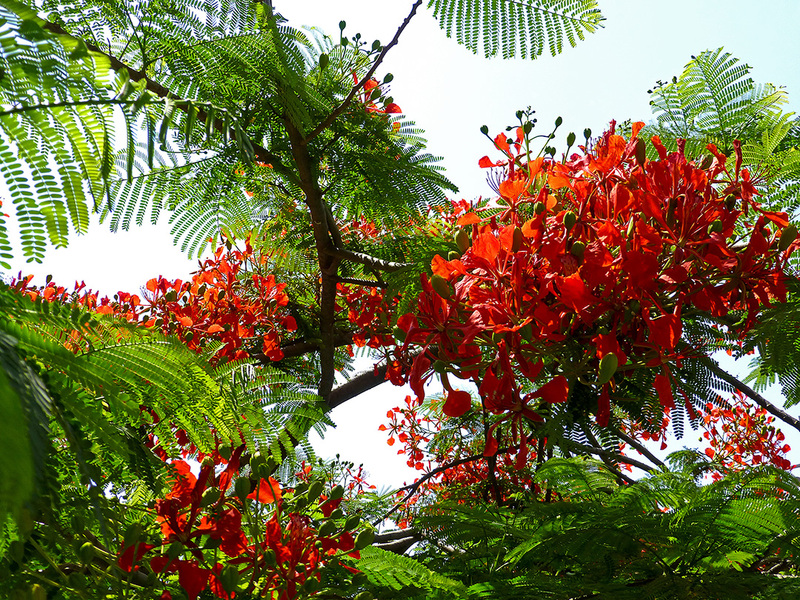 Yes, I know, the Poinsettia is the unofficial red flowering plant of the Christmas season — in Mexico, it even shares the name for Christmas Eve, Nochebuena. 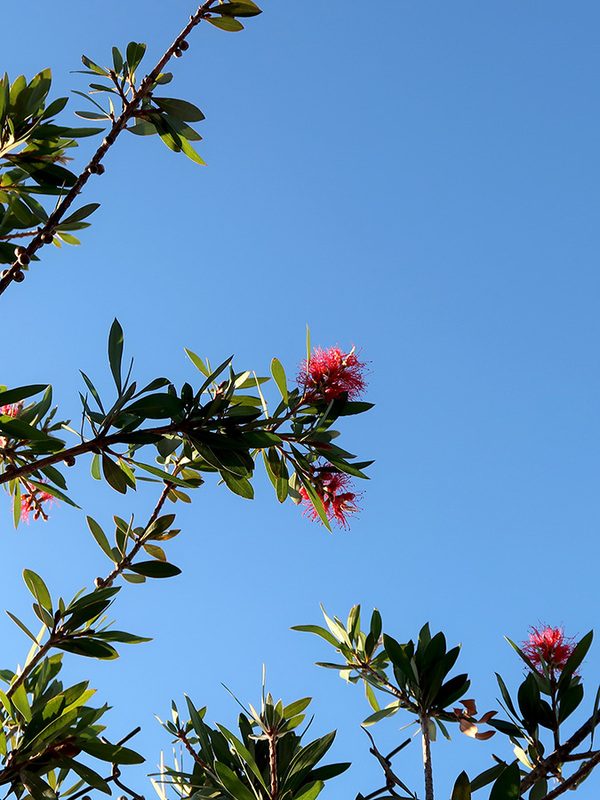 However, there is another red flowering plant that provides holiday color this time of year, the Bottle Brush tree (genus, Callistemon). 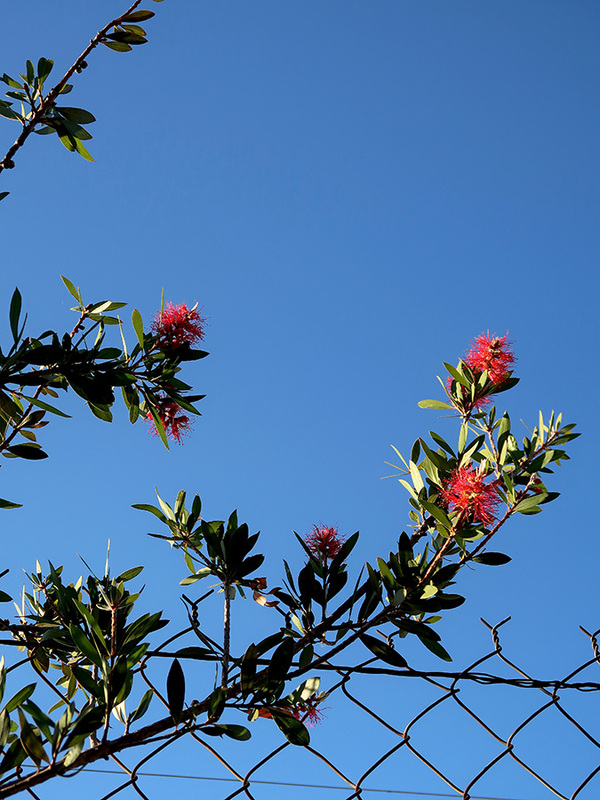 On the rooftop, my container-planted Bottle Brush tree. Any way you look at it, it brightens the day and brings a bit of Christmas cheer to the garden. 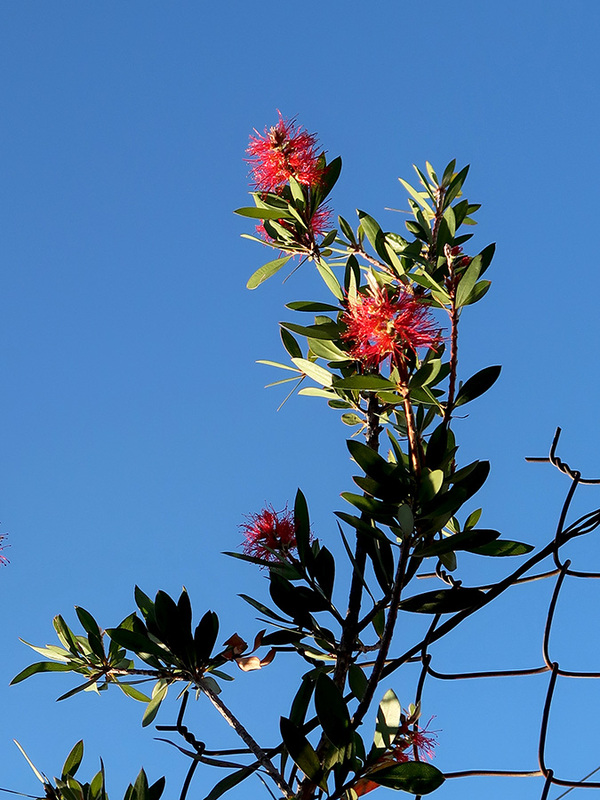 Bottle Brush, the other red of Christmas! 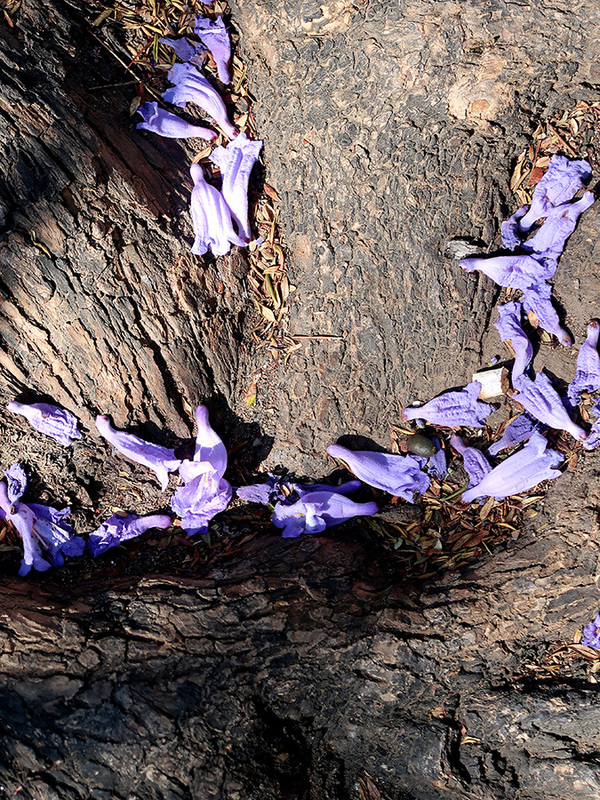 The jacarandas are heralding spring’s approach. 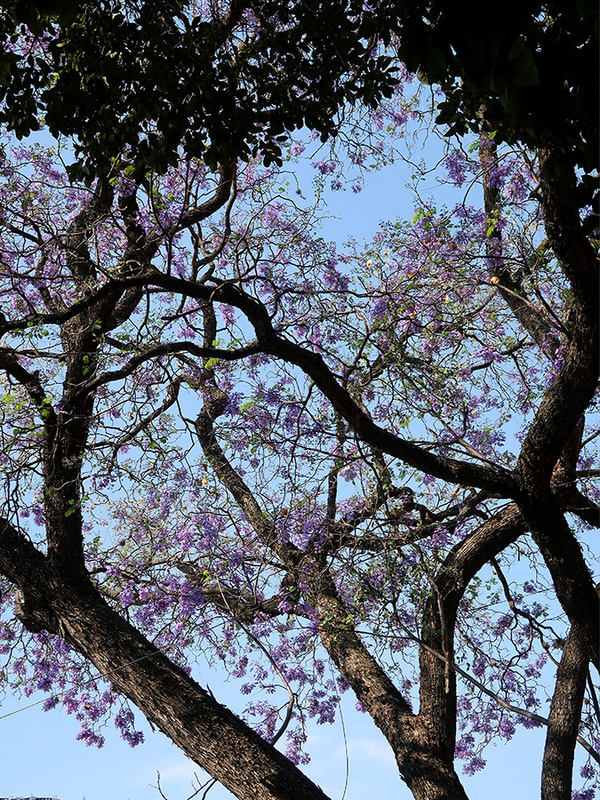 Many thanks to Tatsugoro Matsumoto, one of the first Japanese immigrants to Mexico, for recommending to President Álvaro Obregón that jacaranda trees from Brazil be planted in Mexico City. 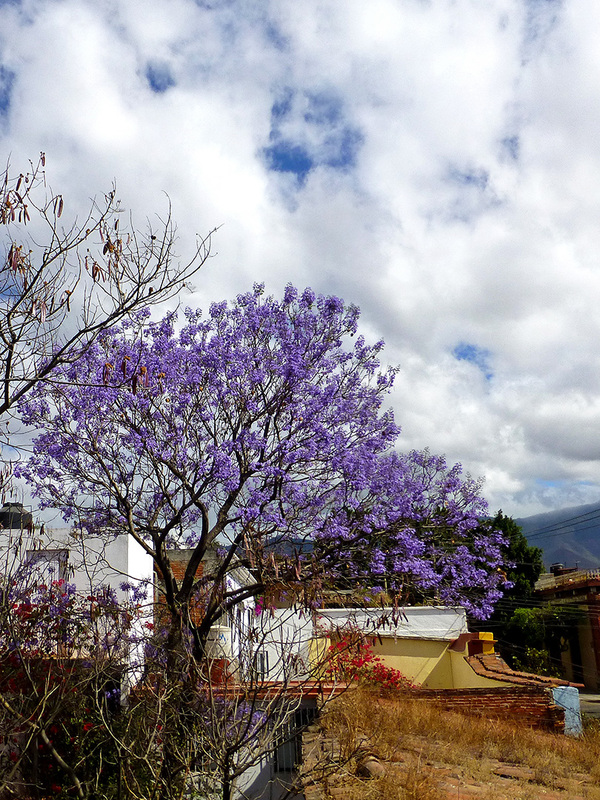 Now, throughout Mexico, underneath the purple rain we walk. 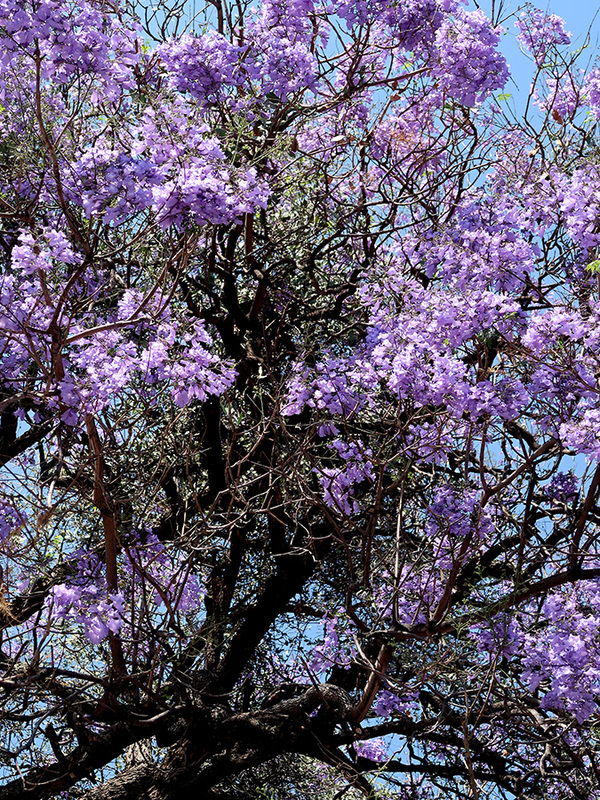 And, this time of year, I always smile, remember, and begin humming Prince’s Purple Rain and Jimi’s Purple Haze. 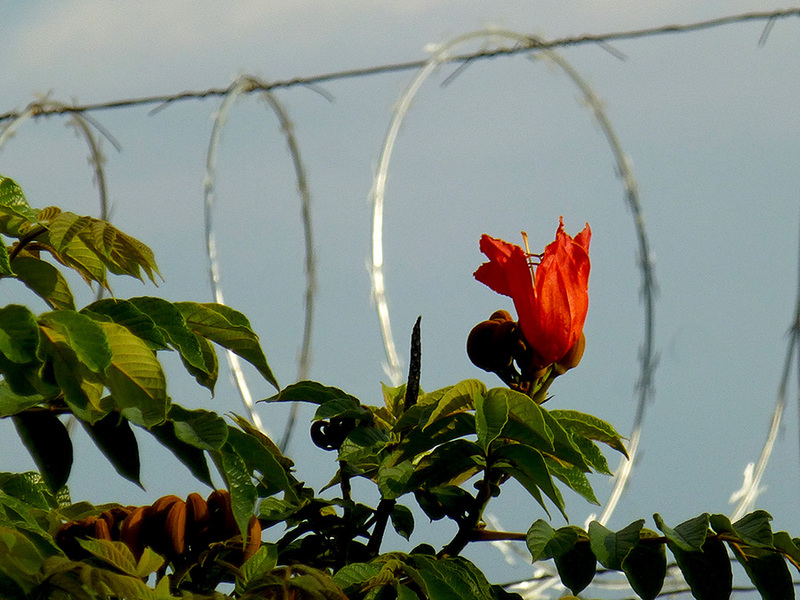 A razor wire (aka, concertina wire) frame for an African Tulip tree blossom. 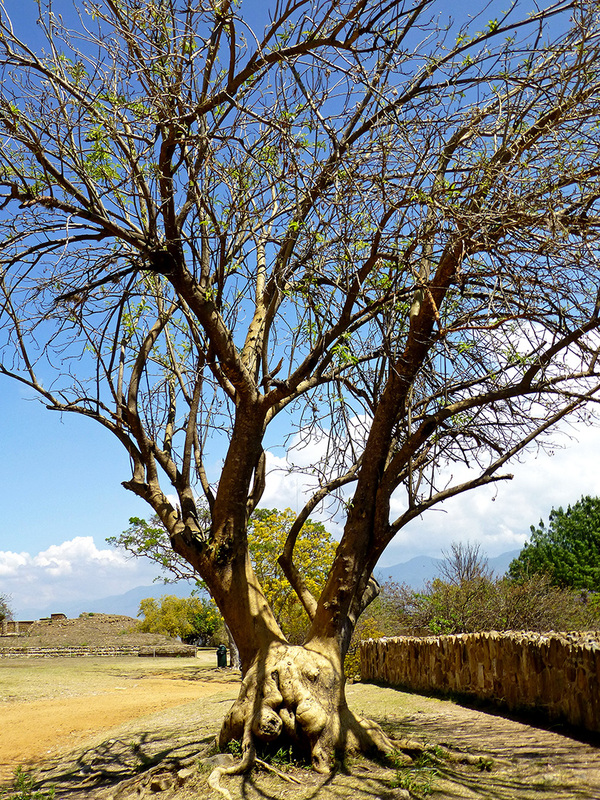 The rainy season not only brings lush greens, it brings the brilliant red-orange of the Árbol de tulipán to Oaxaca. 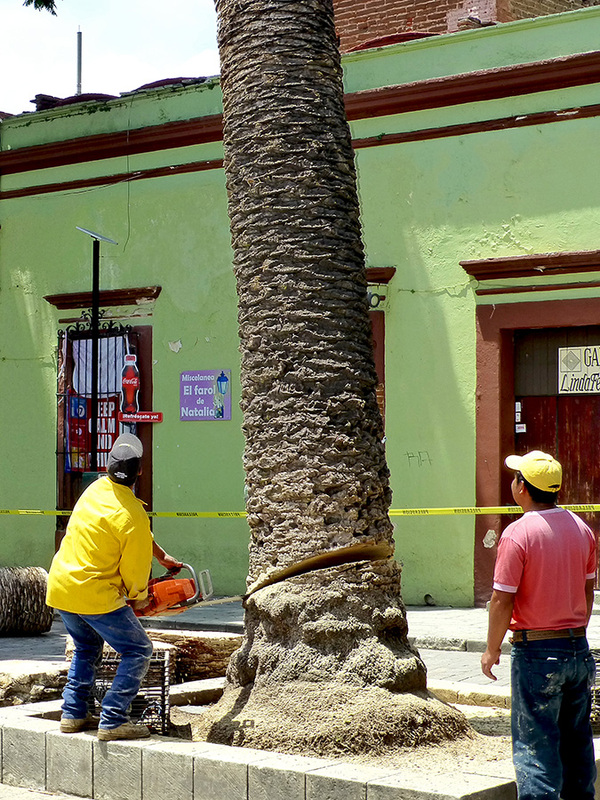 What could be called, A terrace transformed – Phase 4, is currently underway at Casita Colibrí. 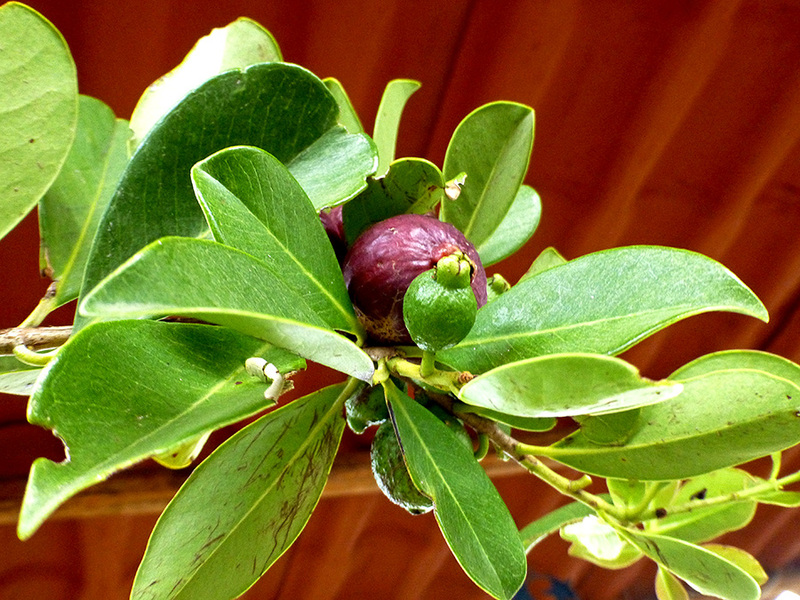 A highlight is the addition of several trees, including a guava (known here as, guayaba) already bearing fruit. I see pitchers of agua de guayaba in my future. 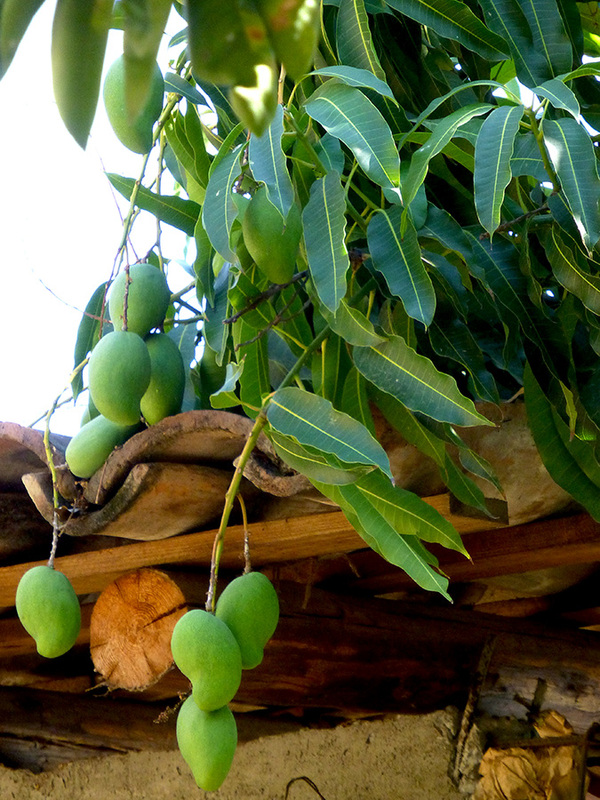 Cooking with Juana… Mangos ripening just out of reach. 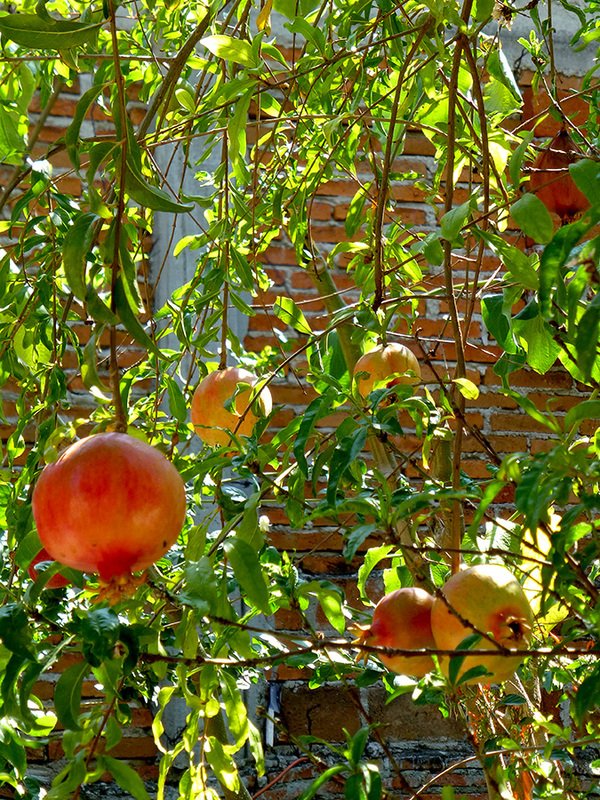 Sunlight filtering through the leaves of the granada (pomegranate) tree. 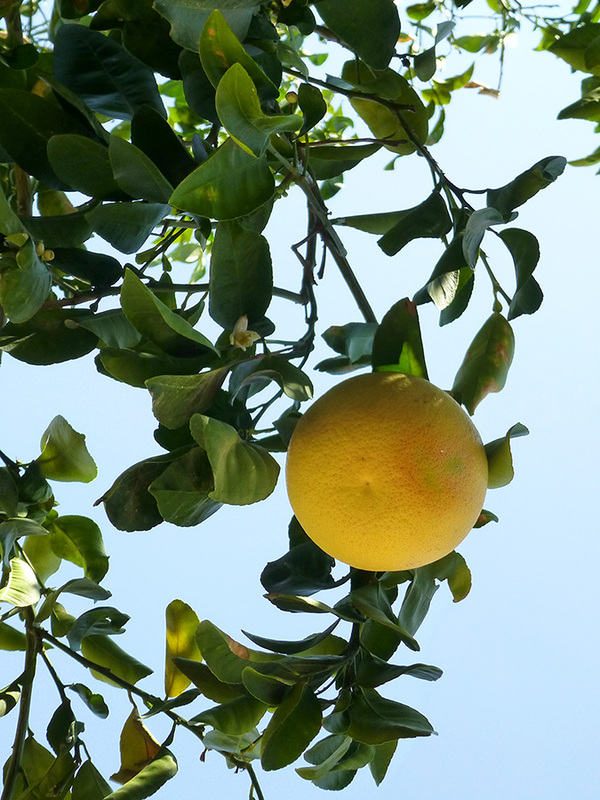 A pomelo (grapefruit) waiting to drop. There is something to be said for outdoor kitchens. I had put off making the trek down to Soriana long enough. Supermarkets, even in Mexico, are not one of my favorite destinations and this is one of the smaller and less pleasing stores in the chain. However, I do enjoy the quiet of the streets on Sunday mornings and besides, I was curious about the drum and bugle corps I could hear practicing. 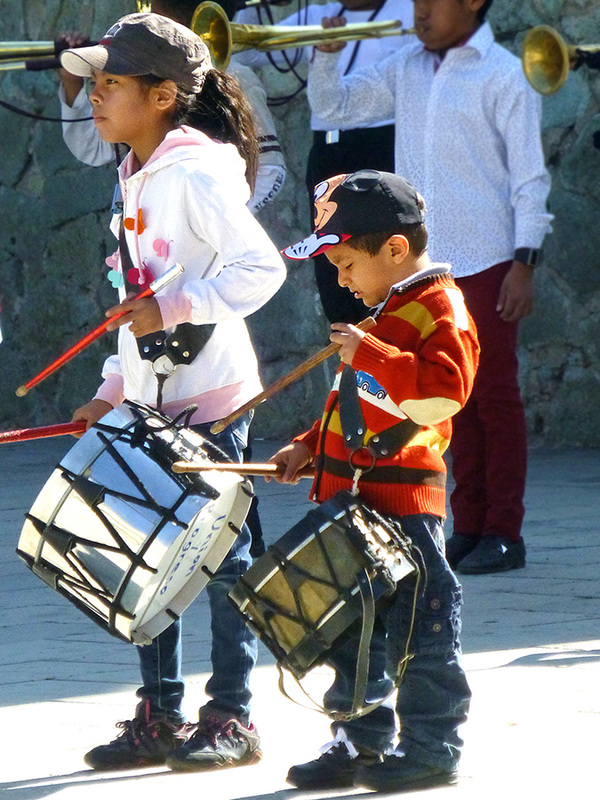 Stop number 1: Watching a little drummer girl and boy in the Plaza de la Danza. 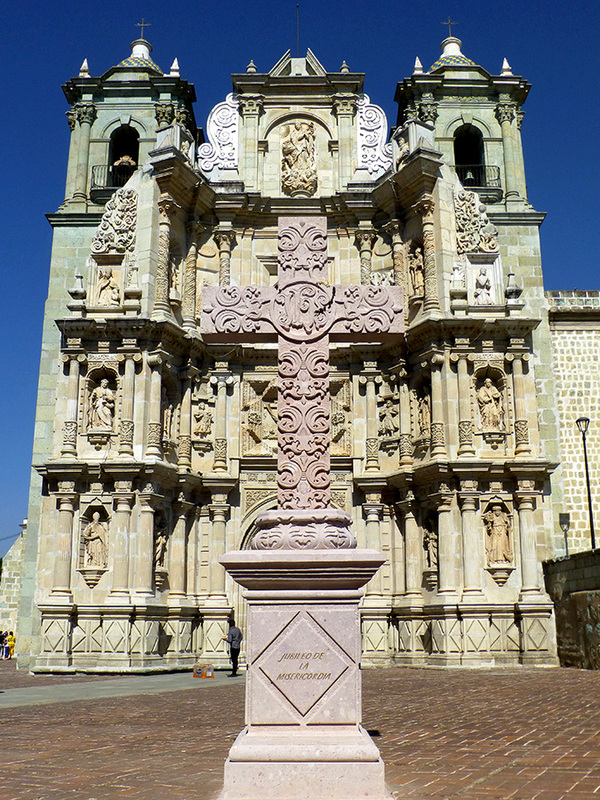 Stop number 2: Noticing a newly installed cross in the atrium of the Basílica de la Soledad. 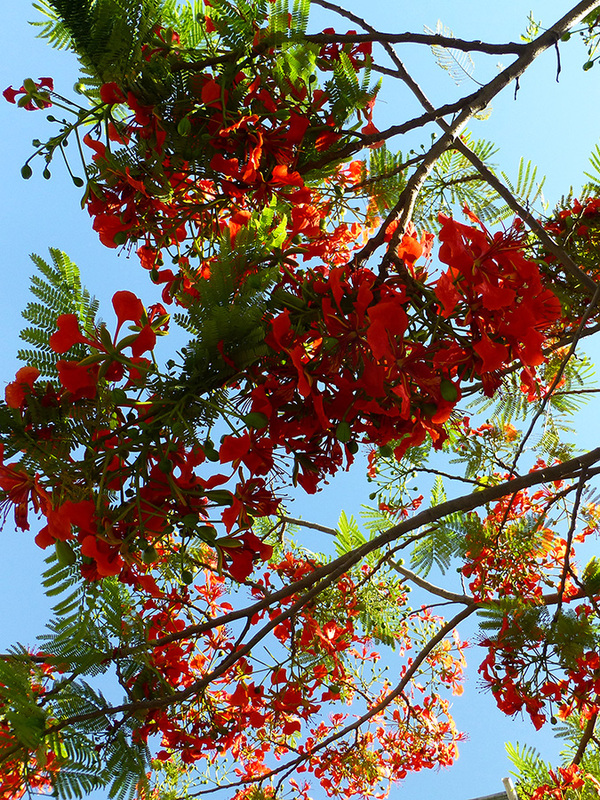 Stop number 3: Feeling like a queen strolling under a canopy of Royal Poinciana trees (Arbol de flamboyán) on calle Independencia. 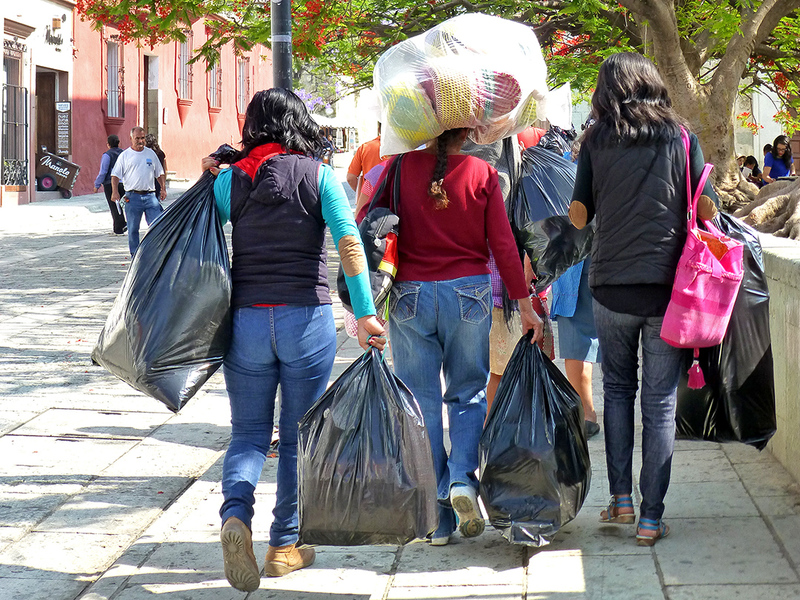 A seven minute walk that took twenty seven — that’s how it is in Oaxaca. 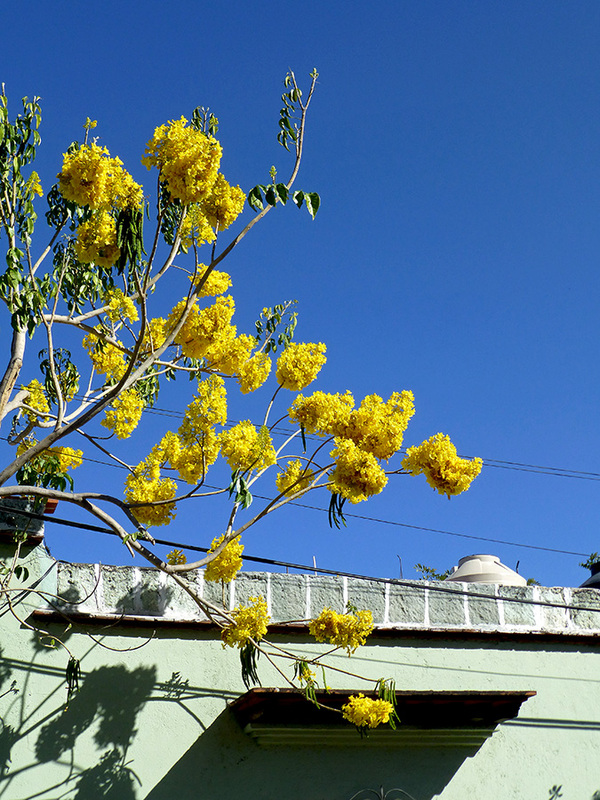 Primavera amarilla (Tabebuia chrysantha) on Calle Porfirio Díaz. 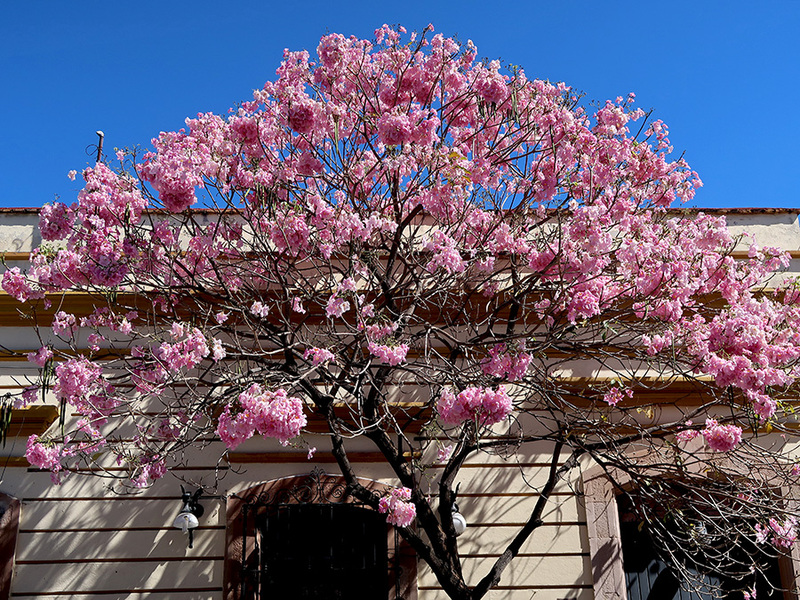 Corner of Calle Porfirio Díaz and Calle de M. Bravo. 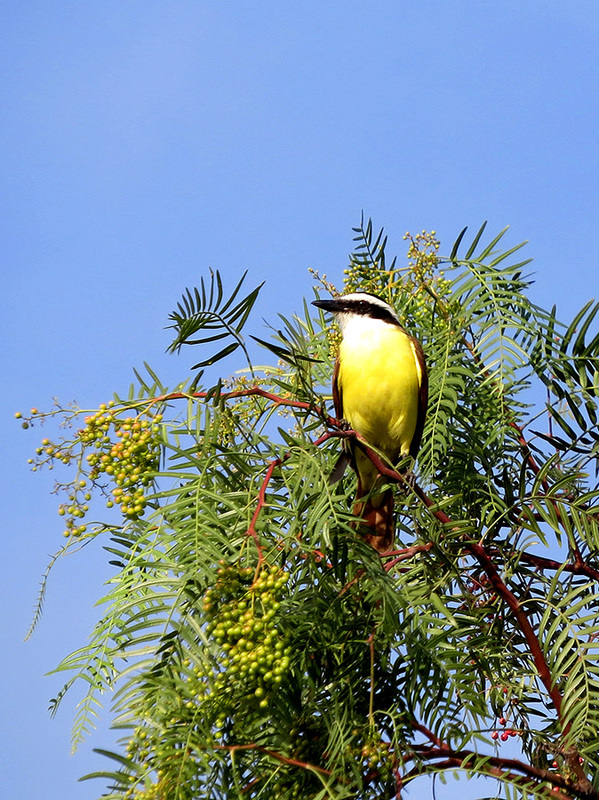 Great Kiskadee sitting in the tree next door surveying the scene. 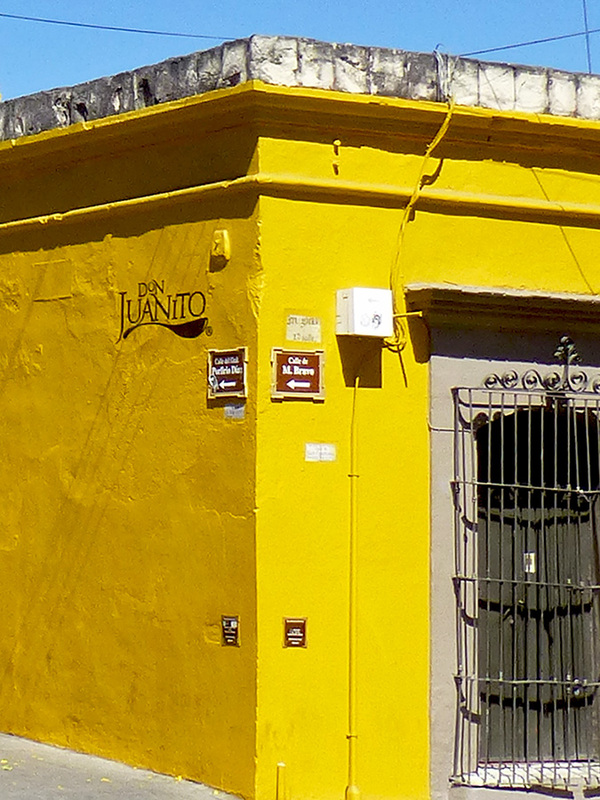 Emiliano Zapata looks out from above the entrance to Espacio Zapata and Atila del Sur restaurant. A. M. A. R. I. L. L. O. Aim high in life and, always seek for peace! As the sun always rises from the east! ! 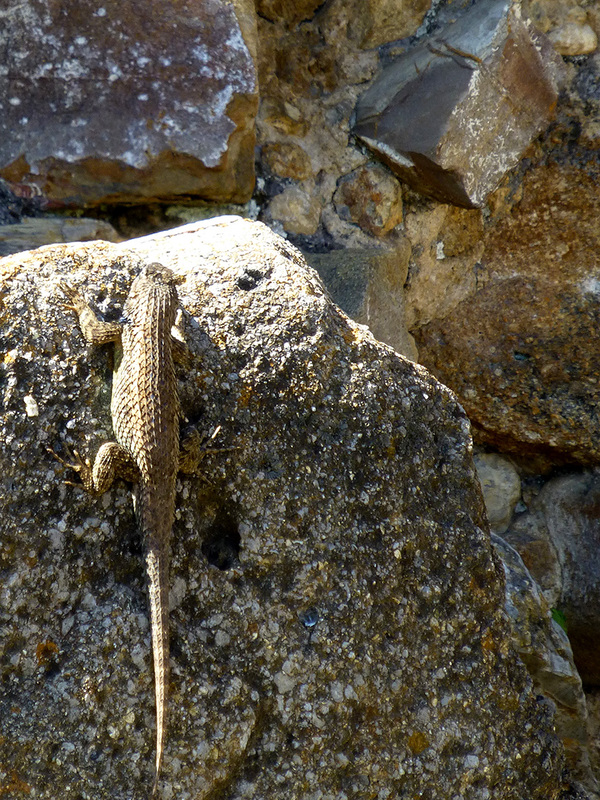 Resting down west to respect the muse of nature. Lights in the sight of the truth! ! Onward with the joy of life. 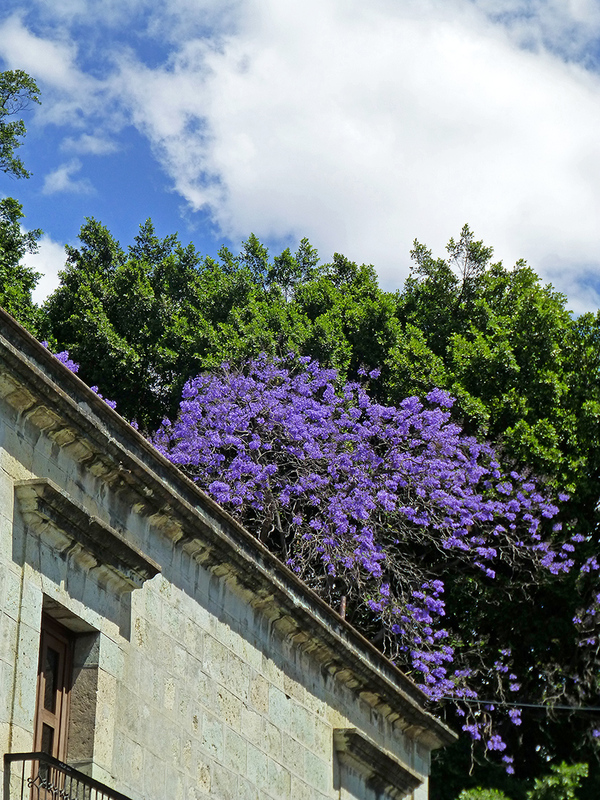 If you’ve been to Oaxaca, you have probably gazed up at the palms along Constitución next to Santo Domingo — an area known as Jardín del Pañuelito. 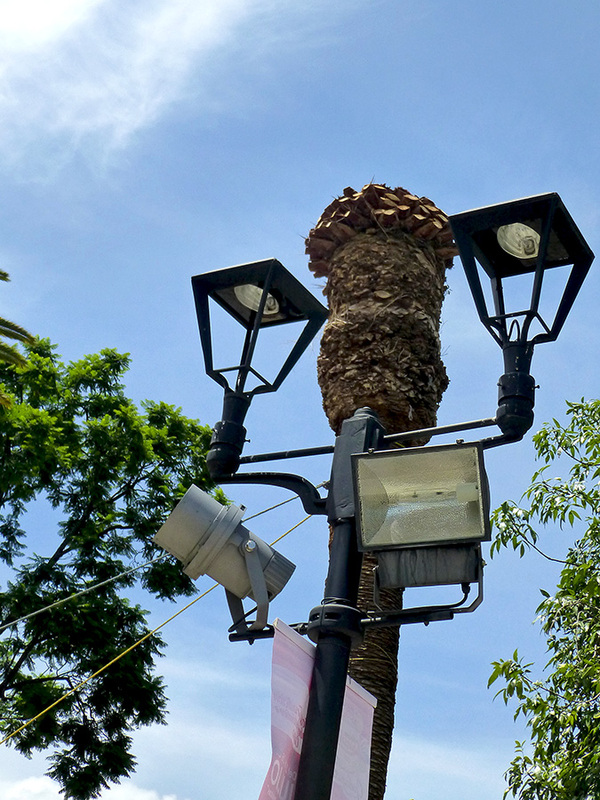 In early 2012, color changing mood lighting was added to illuminate the trees. 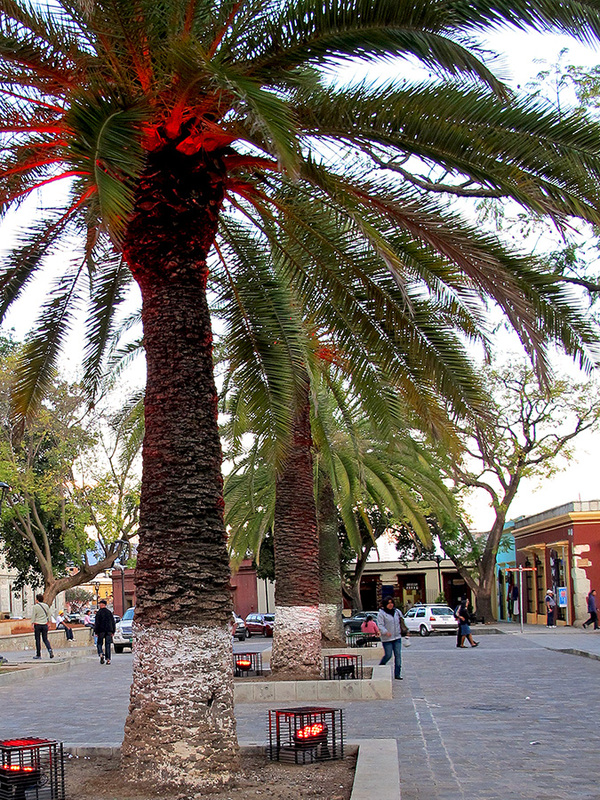 However, last Thursday, on my way to the Oaxaca Lending Library, I noticed something was amiss; fronds had been removed from the tops of two of the palm trees. 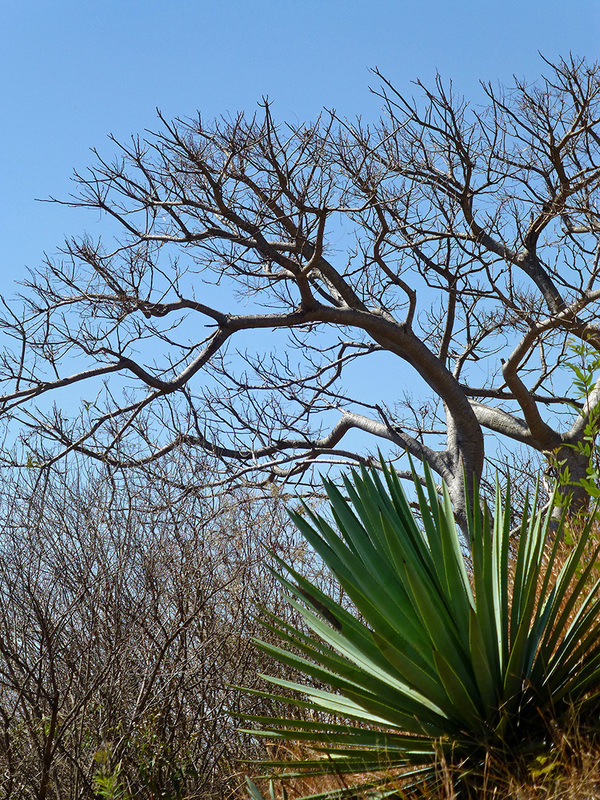 Saturday, the image was more ominous; one of the denuded palms was missing and crowds were focused on another. Timberrrr!!! Down it went, amidst oohs and aahs. 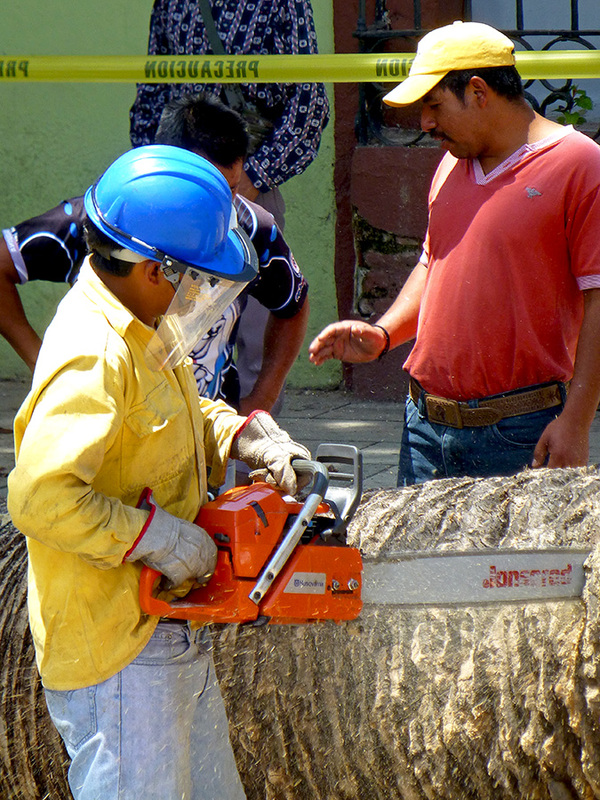 Then the soundtrack turned to the buzz of chainsaws, as workmen began cutting the trunk into manageable pieces. Sad… I know about the where and how, but I’m not sure about the who, what, and why. 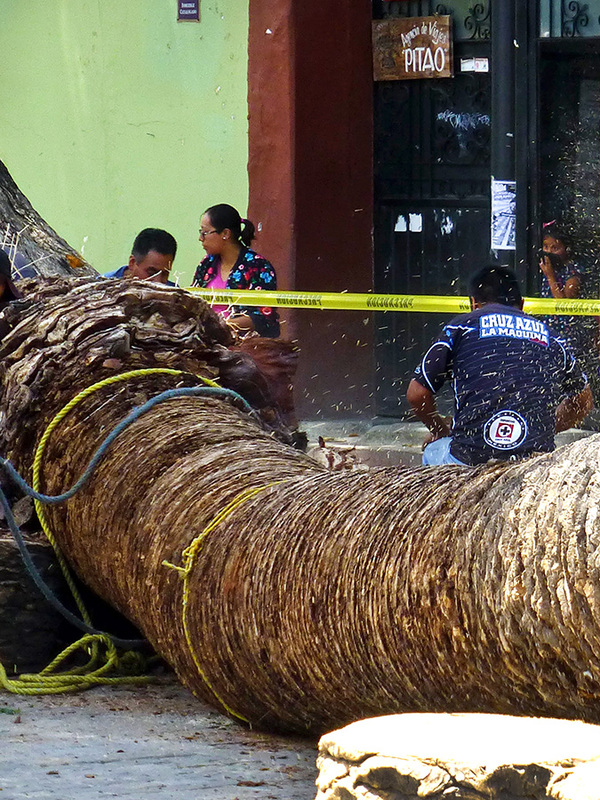 As I left my apartment Friday morning, the sky was blue, the air was brisk and shadows played tag with the ceiba. 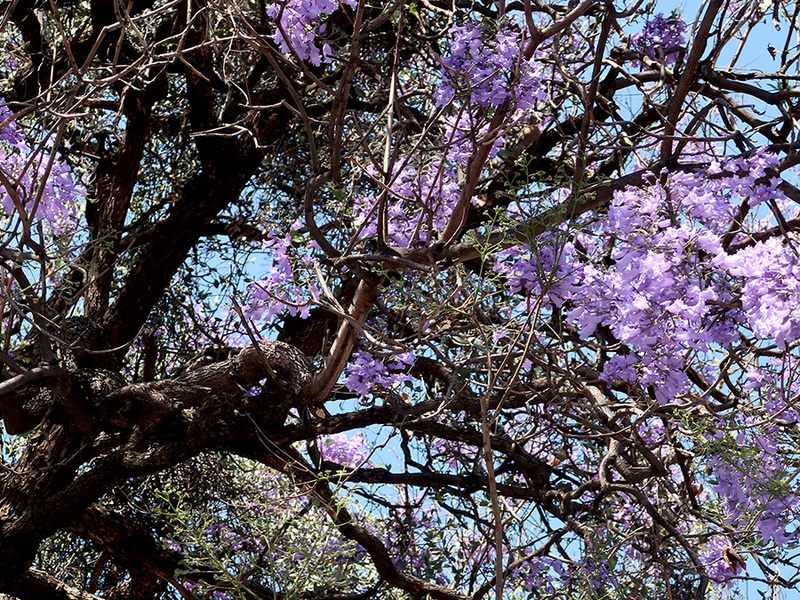 Early mornings in March are magical. 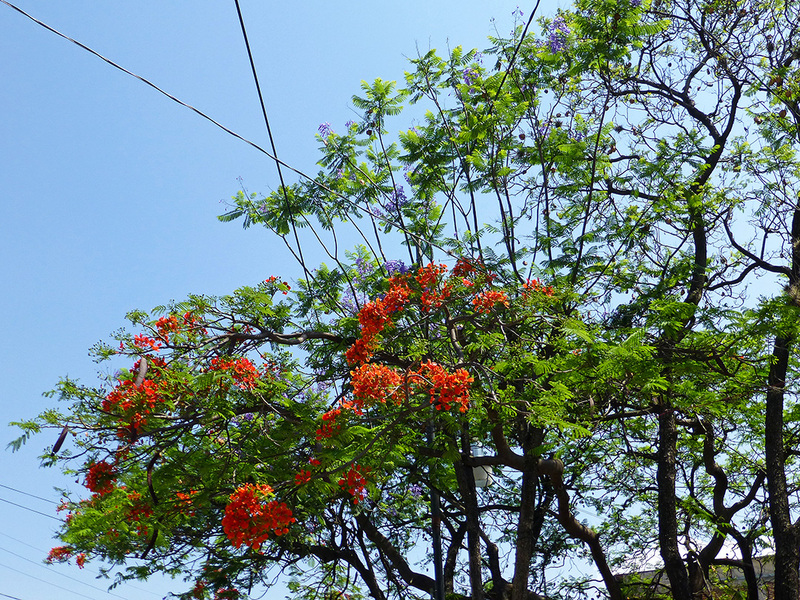 The Flamboyant trees (aka, Delonix regia and Royal Poinciana) have outdone themselves this year. 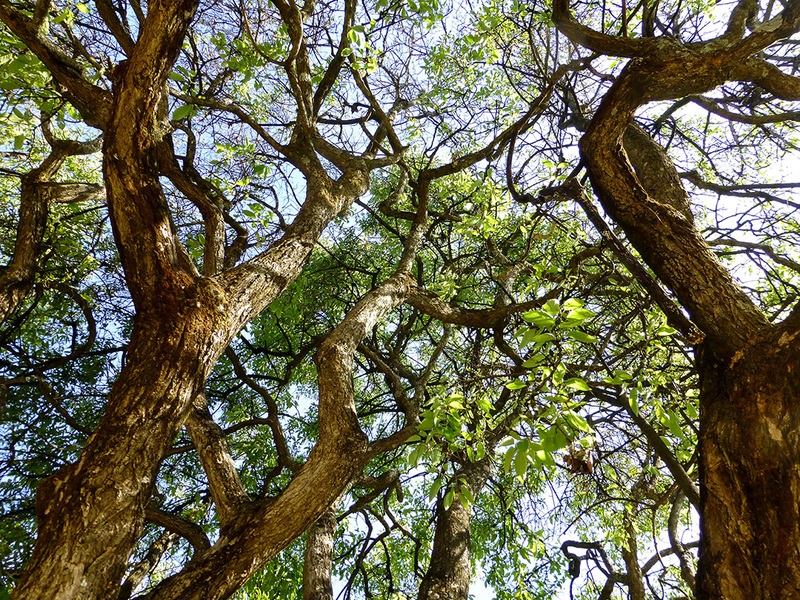 And yesterday, walking home from the market, I was captured and enraptured by their canopy. 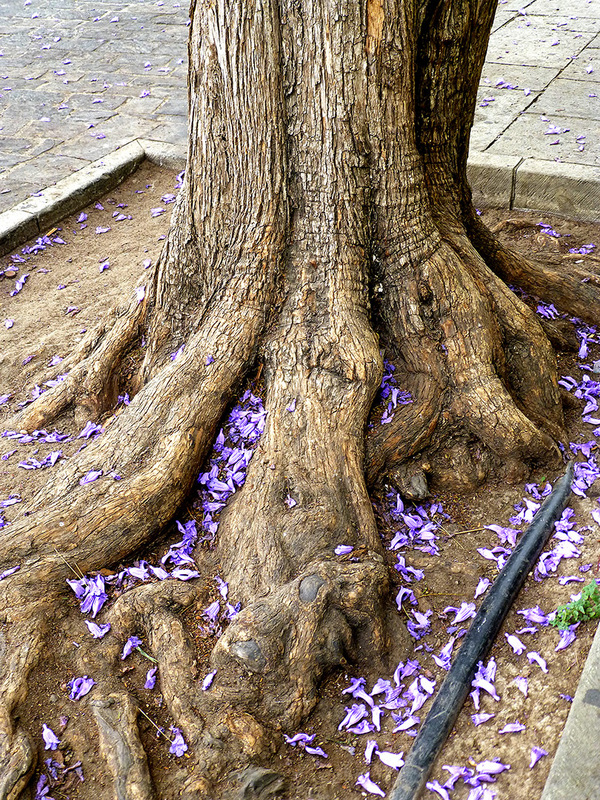 On Independencia below the Basilica de la Soledad. 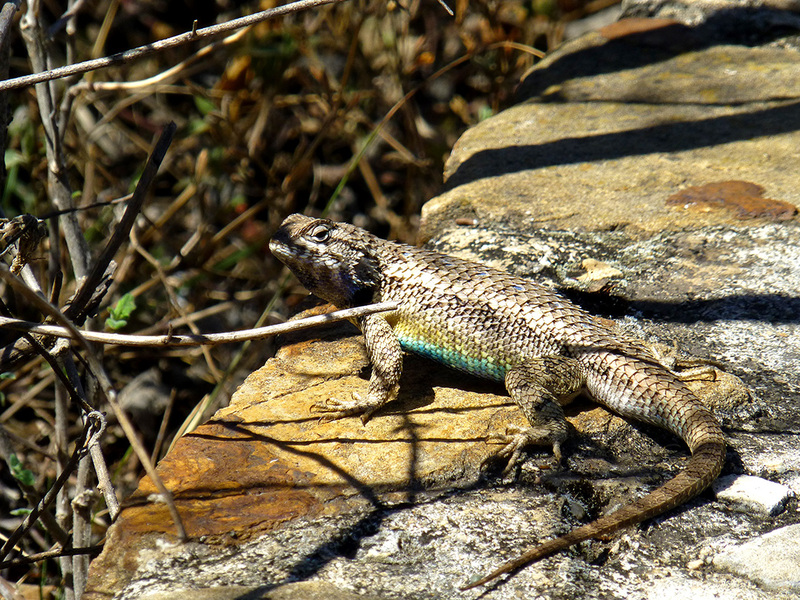 “What do you do all day?” It’s a question I’ve been asked countless times since I began my retired life down Oaxaca way and I’m not alone. Most expats here have heard those words — a query that hints at the notion that there couldn’t possibly enough to fill the day in a place where one isn’t fluent in the language, isn’t surrounded by family and old friends, and doesn’t have a job. A large part of the answer is, doing most everything takes longer. And that is not a bad thing! Perhaps, a photo diary of this morning’s grocery shopping excursion might provide an illustration. After morning coffee and breakfast, catching up on email and the news, washing dishes, showering and dressing, I grabbed a couple of shopping bags and headed out at 10 AM. The initial plan had been to walk up to Niños Heroes (the Pan American highway) to photograph some new murals, cross the highway to the Organic Market, and then return home by way of Sánchez Pascuas mercado where I could get chicken, quesillo, and anything else that remained on my shopping list or struck my fancy. 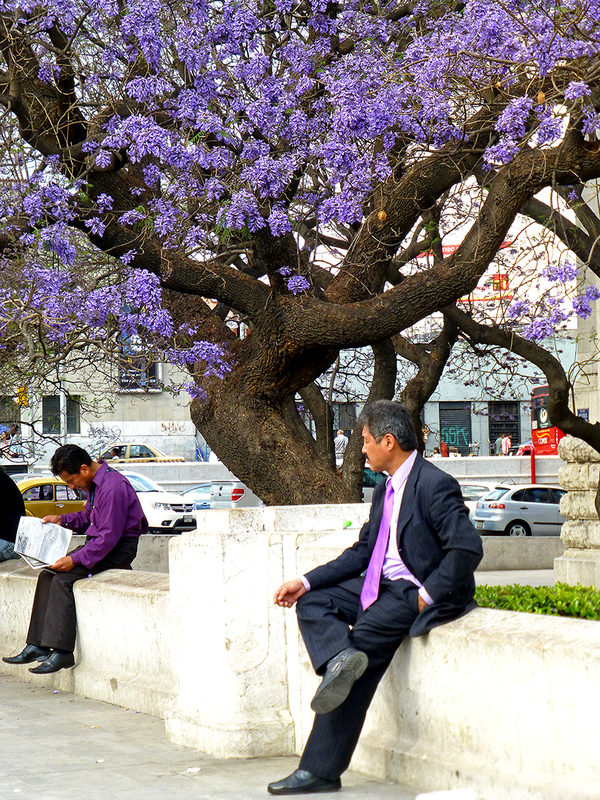 However, for almost an hour, I’d been hearing Guelaguetza music coming from the Plaza de la Danza. 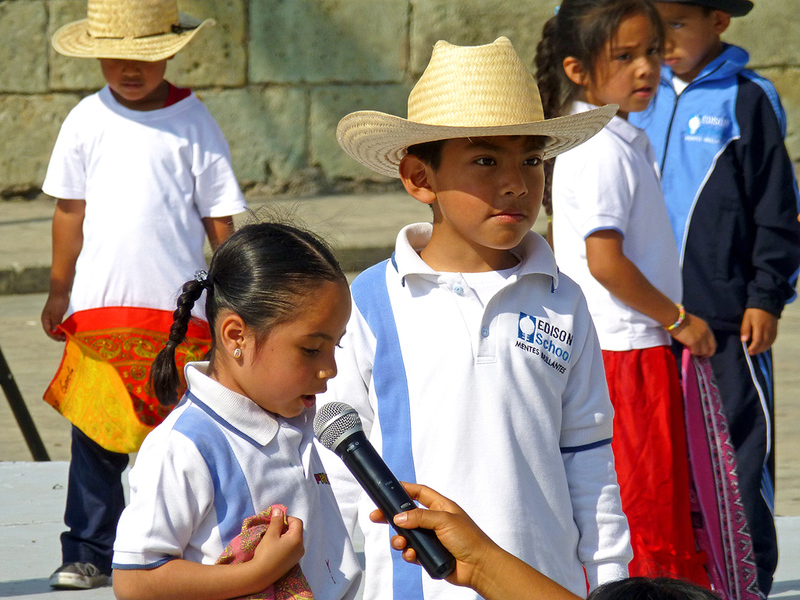 I decided a detour was in order and found kindergartners performing Oaxaca’s traditional folkloric dances, including this one where couples take turns “dissing” each other in a rhythmic double-entendre laden dialogue. It always gets laughs — wish I could understand the jokes! Needless to say, I hung out watching the kids for awhile. I finally tore myself away and resumed my original itinerary. 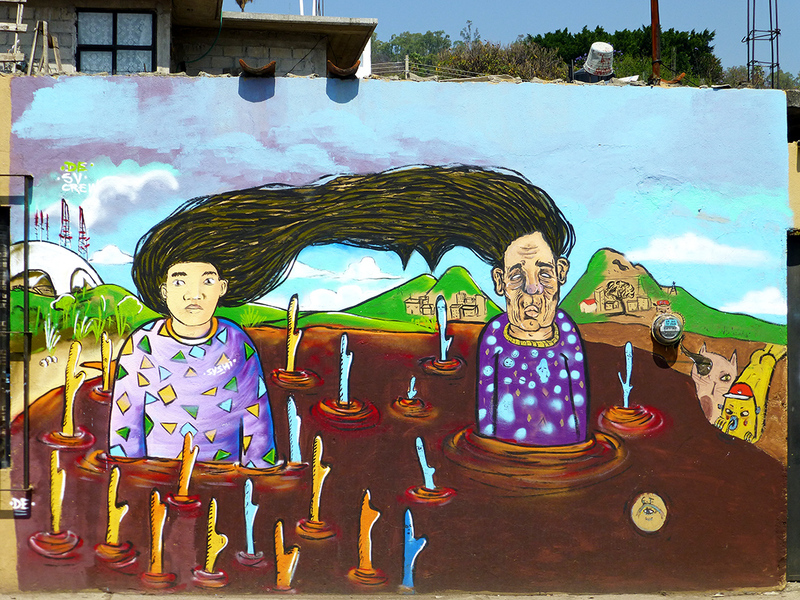 Some of the murals were east of the Pochimilco Organic Market so I decided to start at the end and work my way back — a route which took me up the Macedonio Alcalá where I saw a sidewalk vignette of hats and scarves lined up in front of Santo Domingo. There was also a small marmota (cloth globe on a pole) laying on its side, so I’m guessing there was to be a calenda (parade) of some sort. 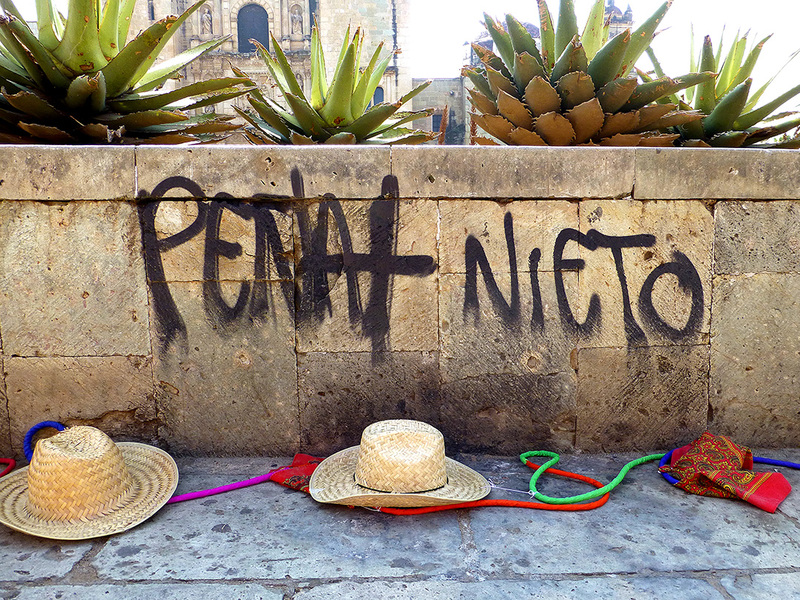 After stopping to take a few photos (how could I resist the juxtaposition with the Peña Nieto graffiti?) I found myself behind these vendors taking their merchandise up to Llano Park for its Friday market. 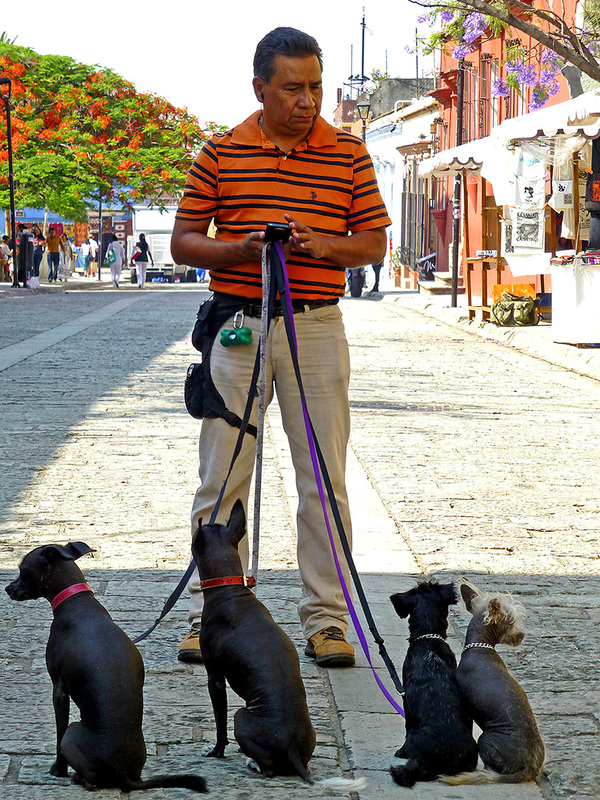 Deciding to speed up my slow progress on the errands I’d set forth for the morning, I passed the gals only to stop to watch Oaxaca’s version of the dog whisperer working with four Xoloitzcuintlis (Mexican Hairless Dogs). 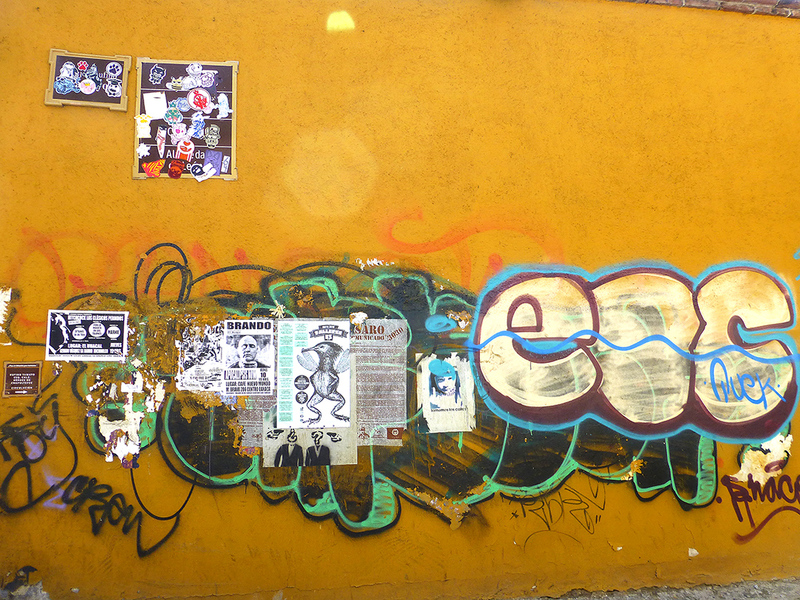 Eventually continuing north, I arrived at Niños Heroes and the murals and street art I’d come to find and photograph. They deserve their own blog post, so I will save those photos for another day. However, I also ran across this wonderful wall! Crossing the highway, I found the newly built and landscaped stairs (almost didn’t recognize them) leading up to Xochimilco and the Pochimilco Organic Market. 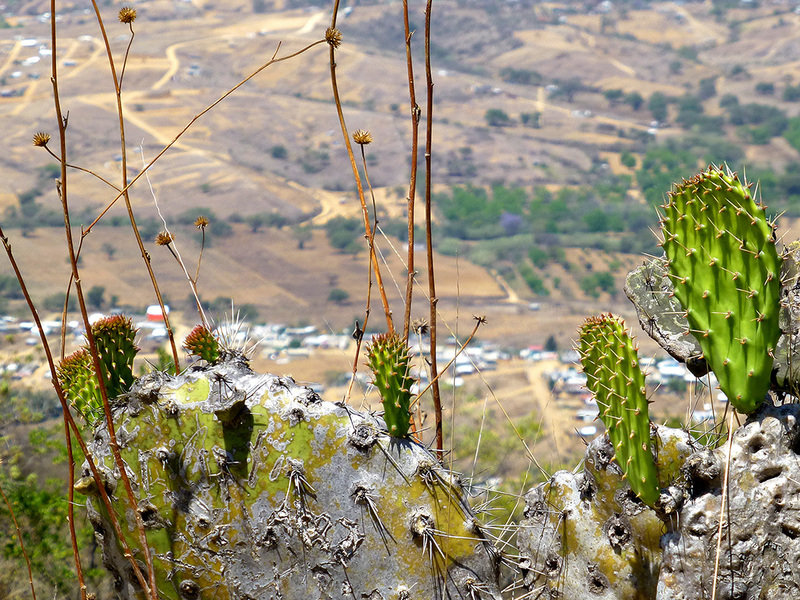 I wandered and lingered and tasted — including a few of these mezcals, as I’ve got a US trip coming up and a stepson who probably won’t speak to me if I don’t bring him a couple of bottles. 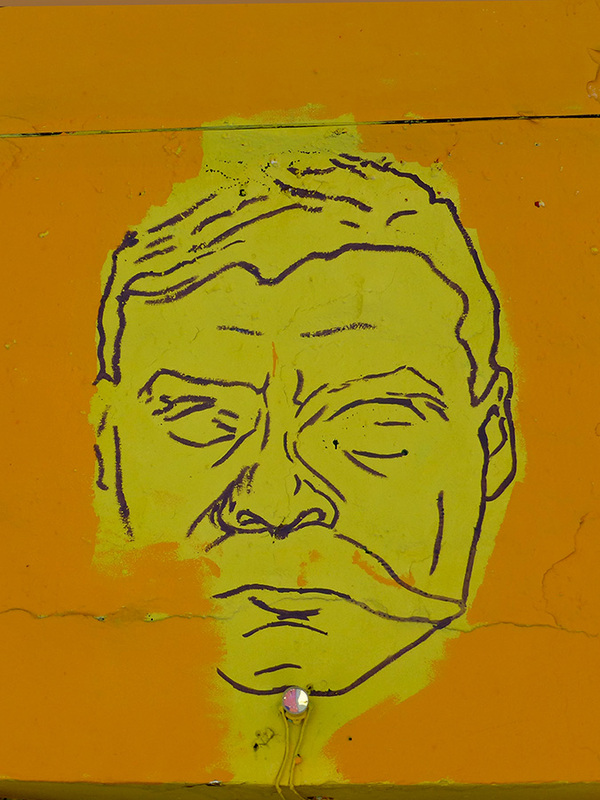 Popping some gum in my mouth (didn’t want my breath to smell like I’m a lush), I headed south on Tinoco y Palacios to catch a couple of new murals I’d had fleeting glimpses of when returning from last Sunday’s trip to Tlacolula. This one had particularly caught my eye. 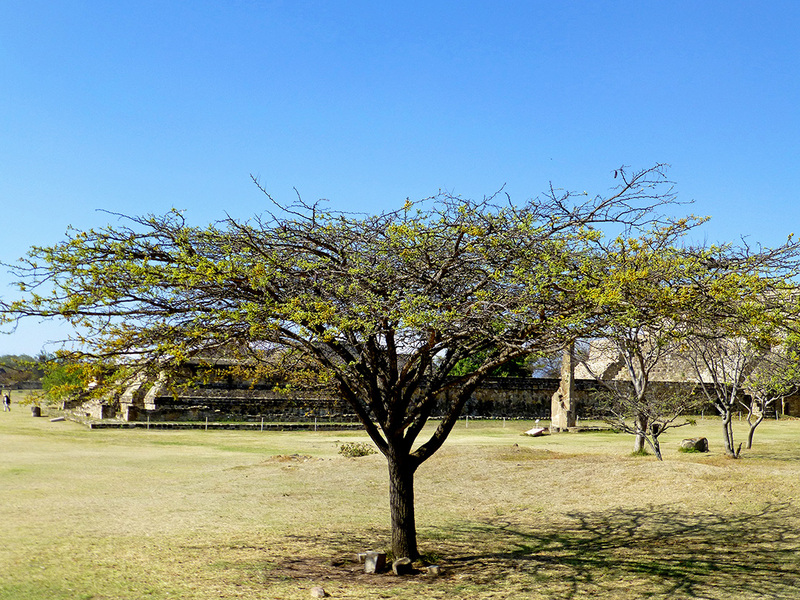 By the time I arrived at Sánchez Pascuas, it was after 12 noon. I found my poultry guy, paid a visit to the cheese vendor, picked up some veggies from my favorite produce gal, and, on the way out, bought some homemade salsa verde. 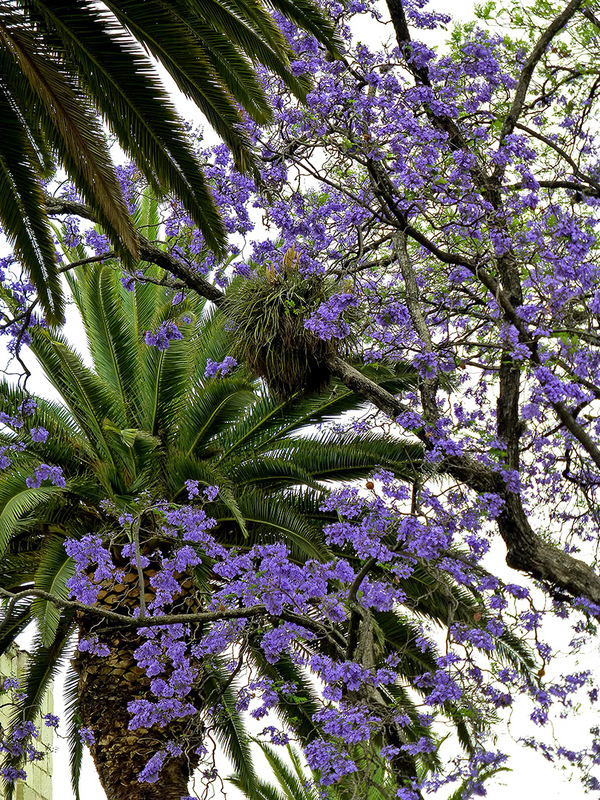 Yummm… As I descended the three stairs down to the sidewalk, I turned around to admire the beautiful color of the flamboyant and jacaranda trees and the tranquility of this setting in the middle of the state’s bustling capital city. It was close to 1 PM when I unlocked the door to my apartment. 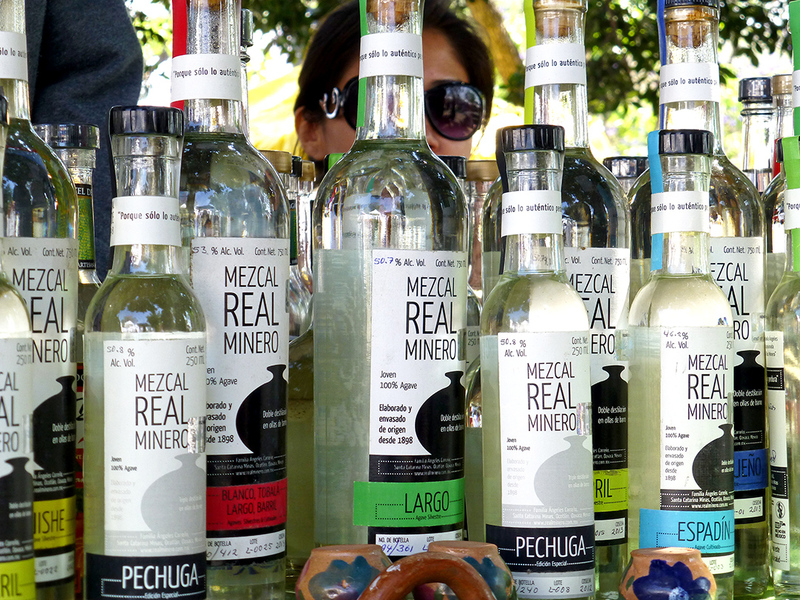 If I were in California, I would have jumped in the car, driven down to the local Friday organic market (with not a drop of mezcal in sight), browsed a bit, spent way too much money, climbed back in the car to finish shopping at Safeway, before returning to the house, probably by 11 AM. 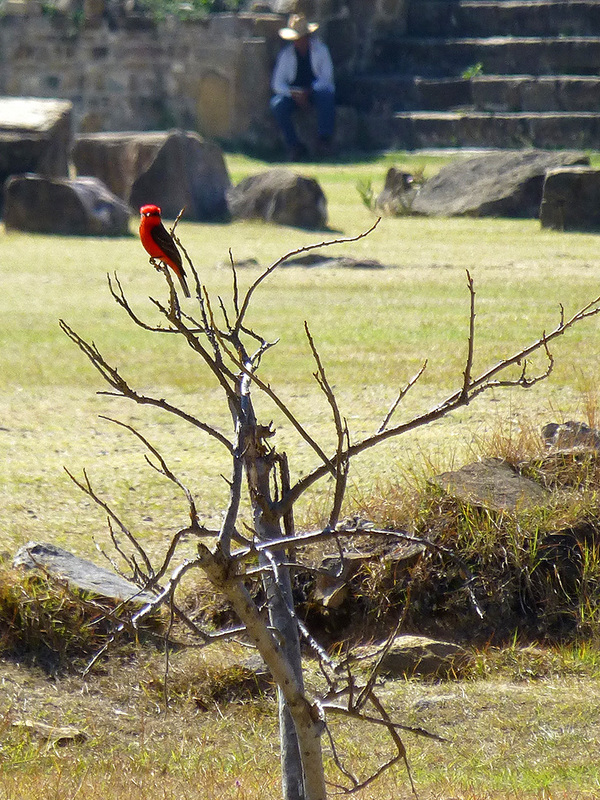 Here in Oaxaca, I’d been gone almost three hours, walked close to fifty (often hilly) blocks, and seen some wonderful, creative, and life affirming sights. 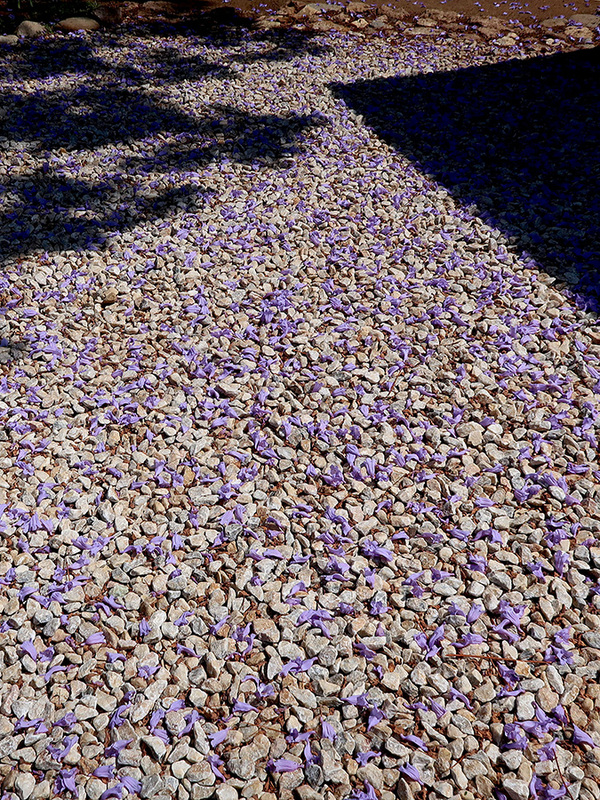 And, that doesn’t even include the scattering of conversations with my neighbors and Luís and Luci, who work here. Just another Friday. Not a bad way to live one’s life! actin’ funny but I don’t know why. ‘Scuse me while I kiss the sky. 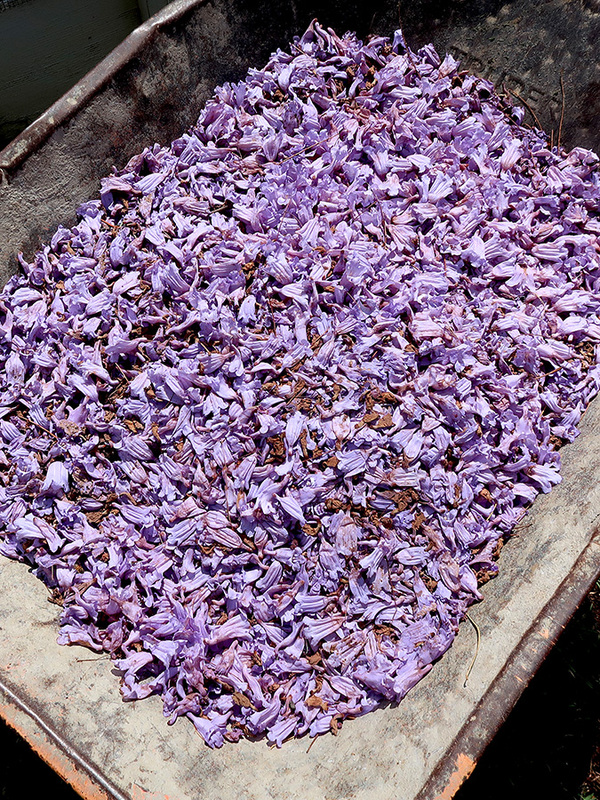 Yeah, Purple Haze all in my eyes, don’t know if it’s day or night. You’ve got me blowing, blowing my mind. Is it tomorrow or just the end of time? 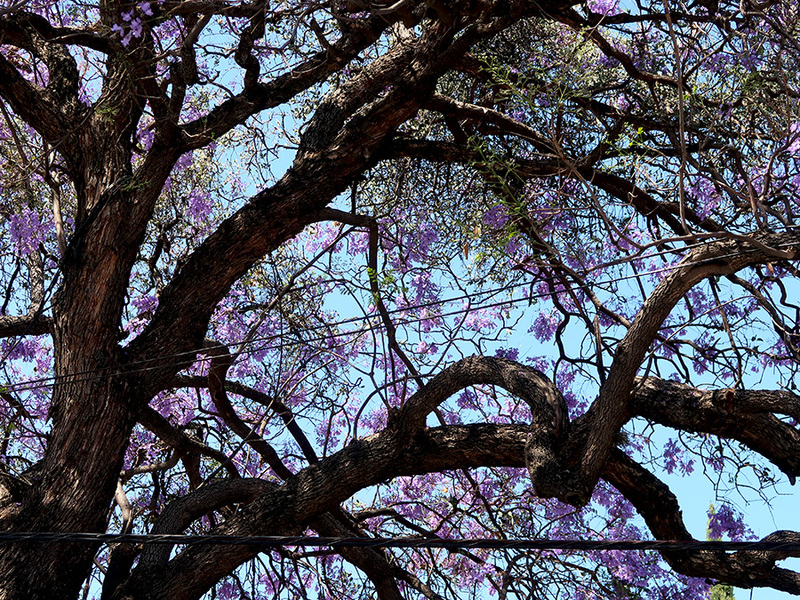 Thank you Jimi Henrix for Purple Haze — THE jacaranda season soundtrack!